Ainsley Sosnowsky and Karrah Cochrane—ages 13 and 11—are the only members of the youth group at St. Andrew’s Presbyterian Church in Salmon Arm, British Columbia. Although small in number, their efforts will transform the life of a community in Africa struggling with water shortages. 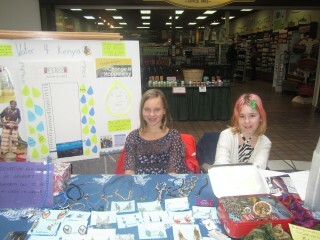 Ainsley Sosnowsky and Karrah Cochrane operating a clean water awareness and fundraising booth at Salmon Arm mall. While turning on the tap to get a drink or flushing the toilet are automatic reactions for most Canadians, 780 million people around the world don’t have access to clean water. Diseases linked to dirty water, inadequate sanitation and poor hygiene are responsible for nearly two million deaths each year. Passionate about clean water issues, Ainsley and Karrah embarked on a mission to raise $3,300 to construct a new well through PWS&D’s clean water program. A job well done: Ainsley Sosnowsky and Karrah Cochrane present a cheque for $3,900 to General Assembly Moderator, Rev. Stephen Farris at a Harvest Dinner at St. Andrew’s Church. Also pictured is St. Andrew’s pastor, Rev. Woldy Sosnowsky. 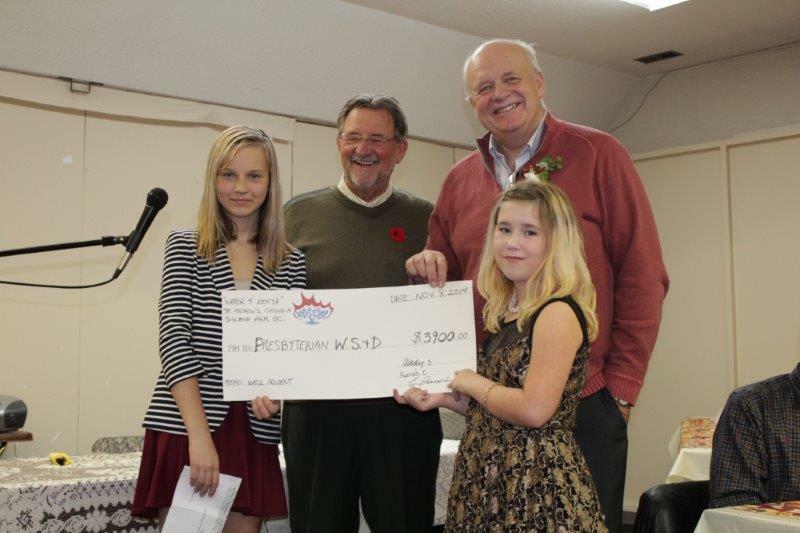 Exceeding their goal, the girls raised $3,900.00 for PWS&D. The money is enough to not only dig a well, but to also train a village water committee and purchase three latrines. The clean water provided by wells is essential to life. Thanks to Ainsley and Karrah’s hard work and dedication, a community will finally have access to this necessity and more. Latrines, combined with training in hygiene practices, will help prevent the spread of disease. The village water committee will maintain the new water source for the long-term, ensuring the community always has clean water. Thank you to everyone who made this amazing project possible!